Wells Taylor, Long Lake Plantation, Helena, Ark., holds the fruits of his labor: a collection of marbles found across his farmland. Childhood secrets are hiding in the dirt. Months after crops are harvested and fields stripped to bare brown, the slanted rays of morning or evening sunlight fire large circular patterns of crushed glass spread across farmland. Glitter sprinkled over soil, the shining glass graveyards at field edges are the stubborn remains of sharecropper and tenant farmer sites once dotting even the most remote Southern farmland. The shotgun houses and clapboard shacks are gone, but a child’s toy waits patiently, lingering in the rows. Time, tillage, and rainfall reveal the sharecropper’s last testament: forgotten clusters of magnificent clay, agate and glass marbles. On a clear day in early May, Bernie Wright is walking rows, eyes down and head moving gently back and forth. A single inch of rain has parked Wright’s cotton planters, but it hasn’t kept him out of the fields. There’s something special about the marbles in these fields and I love finding them," he says. "They meant a lot to somebody long ago and maybe that’s why I enjoy looking." Wright, 57, is searching at mid-day and doesn’t need sun on the horizon to fire glass and serve as a site map, because he already knows where the old homes stood. Most of the tenant houses were torn down in the 1960s and Wright, farm manager at Longino Planting Co., in Jonestown, Miss., remembers the locations from childhood. Before the advent of heavy machinery capable of servicing thousands of acres, the flat vista of Mississippi Delta farmland was heavily pocked with houses lining turn rows and county roads. The tenant system required on-site workers and the accompanying logistics translated to a range of housing layouts, from an isolated handful of dwellings on a back road to scores of homes concentrated around a commissary and schoolhouse. Necessity dictated tenants live and work at the same location. The old house sites are a slurry of glass shards, stoneware chips, bricks, buttons, coal, mangled cutlery, cork-top bottlenecks, and much more – the detritus of a farming day long since passed. Yet, in stark contrast to the other crushed remains, time has been kind to the marble spheres. Small enough to evade tillage tools, tough enough to withstand compaction, and colorful enough to draw the human eye, marbles have endured the age of mechanization. When a marble rests just below the soil line, rain and wind start an umbrella action, and the smooth spherical marble surface sheds dirt particles, leaving the rounded top naked to a searching gaze. With a bit of luck and time, a marble exposed in a raised bed and cleaned of debris may follow the grade and roll down into a furrow, as if just dropped from a child’s hand into a row. More often, only a sliver of body shows in the dirt and offers one chance to claim a marble before weather, crops or machinery cover it again. After church on a spring Sunday, Chris Kale eases along a turn row with wife, Cindy, and a truckload of grandkids, looking for house sites. A 2” rain fell four days prior and Kale knows the ground is ripe for marble hunting. He spots a slightly raised hump just off the turn row and sees glass scattered across soil a shade darker than the surrounding field. In seconds, the family spills out of the truck and the hunt is on. The Kales spread out 3’ to 4’ apart and methodically canvass a roughly 100’-by-100’ section to compensate for tillage spread of houses that were often originally 40’-by-40’. Equipment and land leveling push marbles across all points in a given field, but the vast majority remain in proximity to home sites. “It’s all about family, the hunt and history,” Kale says. Kale, co-owner of Farmers Supply in Marvell, Ark., hunted arrowheads as a boy and began taking his own children on marble searches in the late 1980s. The weekly treasure hunts turned into a family constitutional, and at 58, Kale isn’t slowing down. Simply, he is a marble whisperer and has honed his skills with a focus on location, timing, possibility, quality, quantity and blind luck. Bernie Wright, looking for marbles. Most sites around Marvell date from the late 1800s to the 1960s, Kale estimates. Families typically had four to eight kids, and despite poverty, marbles were the sole luxury afforded to children. A subsistence sharecropper, unable to buy any other toy for his kids, could still afford to purchase marbles. Even today, find a beautiful agate with a distinct pattern, and chances are the same house site is hiding many more similar specimens – direct evidence of a quantity bag or box purchase at a general store or commissary. Marbles were part and parcel of youth, the single most ubiquitous item of childhood. Poor or poorer, marbles were the great equalizer. The treble of affordability, quantity and durability explains the overwhelming numbers of marbles found today on farmland. Kale estimates a sharecropper child might have owned 20 marbles at a given time. However, when a single house site spits up 75 or even 100 marbles, questions mount as to why and how. “I can’t believe kids lost as many as we’ve found on some sites. In fact, I think these marbles were sacred in a way to children,” Kale says. “There was more going on than kids losing marbles. Lost during play, thrown away by momma, or left behind when a family moved, all of these are parts of the puzzle." The evidence in the ground doesn’t necessarily match conventional logic at some house sites, especially those which don’t produce marbles. Kale cites a tenant house he remembers from childhood, a home to multiple children and a particular hub of activity. He’s scoured the knoll for years and found coins, buttons, and porcelain, but not a single marble. Beyond the telltale glass scattered across home sites, Kale paints a rough mental picture of typical marble locations. Concentrations correspond with play zones, the actual spots where kids gathered, drew circles in the dirt, and shot for keeps. The zones share one overriding trait: shade from the Delta sun. Either under a porch, against the north or east side of a house, or beneath a tree, a game of marbles was shot in the shade. Find a play zone and it’s likely to be a marble honey hole. Willie Rucker, showing off marbles he's found. To the uninitiated, Curtis Storey, 57, is walking across his east Arkansas ground, checking a polypipe irrigation line, but in reality, he’s also hunting marbles. Storey farms 4,800 acres in Phillips County, Ark., and whether checking polypipe or measuring seed depth, he’s also looking for color. As a young boy, Storey rode atop a metal seat on the back of a four-row planter while his father, Ronald, cultivated cotton. When Storey saw a gleam in the dirt, he would whistle for Ronald to stop, and then jump down to collect the marble. If the engine noise was too loud for whistling, Storey tossed a dirt clod at Ronald to halt the machinery. Storey’s catbird perch was as dangerous as it was fruitful. On a windy, dusty day in 1964, five-year-old Storey and Ronald were planting soybeans on a John Deere 3010 with a single front tire. No cab, no fenders. An old, non-hydraulic marker swung around the front of the tractor as Storey stood on the left side of the back axle to avoid the dirt and held tight to the seat. Racing across the field, Ronald placed Storey in his truck cab, scalded road for the doctor’s office, and slung four buckets of soybeans across the highway. After a lengthy cleaning, a bald spot where the hair peeled up his forehead, a concussion, and a lick of salve, Storey survived by a matter of millimeters. Kale has never counted his farm marbles, but he keeps the collection in a variety of candy jars as proof of his prowess. Thousands of marbles of all sizes, colors and patterns fill the jars, separated by an occasional arrowhead, button or porcelain doll part. His massive marble trove is all the more remarkable considering it was built one specimen at a time: spot, kneel, and pry the past from the ground. He can’t fully explain the primal pull that perpetually draws him into the fields to find another marble. Come spring, Kale will hit the rows again with his family, searching for one more marble hidden in the dirt. 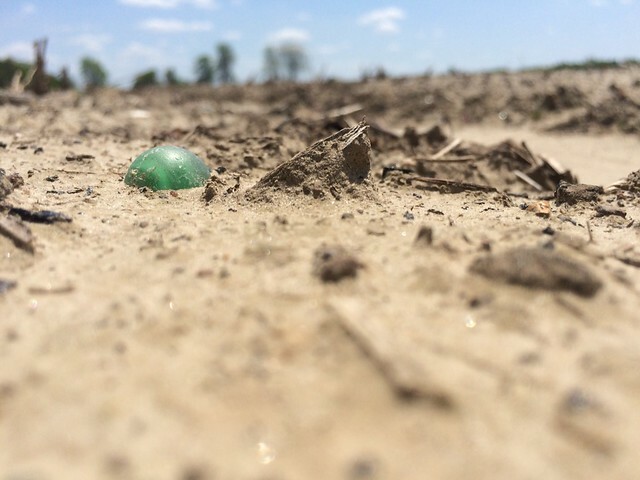 Change is the great constant in farming, yet although the sharecroppers are gone and the houses torn down, the marbles remain, waiting patiently to tell a buried tale. Click on the photo to see more images of farmland marbles. When I was a kid in the 50's we shot marbles for marbles. You put your marbles in a ring and when you shot someone else's marble out of the ring it was yours. Some kids were just better shooters and would have hundreds in a bag. I remember getting steelies from my Dad's shop, old wore out bearing balls. What memories!